We were a little concerned while hunkered down in a storm in Mojave, CA, that our planned visit to Kings Canyon National Park and Sequoia National Park would have to be postponed because of snow at the higher elevations, but we were delighted to find the roads open for those with four-wheel drive and/or chains. No way we were going to skip visiting and communing with these ancient and spectacular trees. We visited Kings Canyon National Park (#5) first because their roads were a bit more accessible. 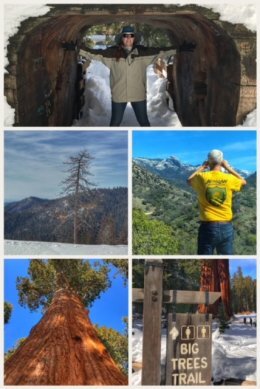 We drove through the Giant Sequoia National Monument on our way, and thoroughly enjoyed hiking in the snow along Giant Tree Trail and attempting to capture the General Grant tree, the second largest tree in the world — and only about 1,700 years old! The trail also includes the Gamlin Cabin, the Fallen Monarch, and the Centennial Stump. We also took a beautiful drive down to Hume Lake, where we hiked around the frozen reservoir (which once supplied water to a flume that floated logs 67 miles to the town of Sanger) while admiring all the natural beauty. In the summer and fall, the two parks are connected via Highway 180, but that road is closed in the winters. 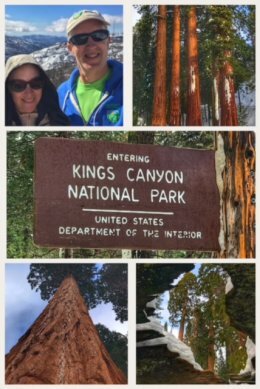 Next, having gained our snow and ice prowess at Kings Canyon, we visited Sequoia National Park (#6) … and once there, never wanted to leave. As we climbed in elevation, from no snow and temperatures in the 60s, we finally hit snow at about 5,000 feet, and as we drove into the Giant Forest on Generals Highway, we were dumbfounded and in awe as around every curve was another beautiful giant sequoia, many with snow on their uniquely colored bark. Photos do not do these tree justice — partly for their color, but mainly because it is impossible to capture their size… their trunk girth and their intense heights. Just simply God’s gift to tree lovers. The Giant Forest is a stand of more than 8,000 of these colossal trees — so named by naturalist John Muir in 1875 — home to half of the Earth’s sequoias. The park has done an amazing job of restoring the area back to its original conditions (by removing roads, structures, campgrounds — all things that can easily damage the root systems, and thus the trees). We contemplated renting snowshoes while in the park, but found most of the trails, while snow covered, pretty manageable in good hiking boots. 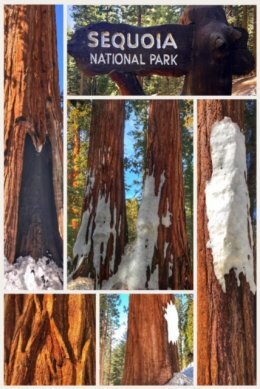 We drove all the way down to Wuksachi Village (which has a pretty large market, and one of the places you can rent snowshoes and other winter gear), then turned back to visit the General Sherman Tree. The hike in only about 1 mile (RT), and your head will spin viewing all the sequoias peeking around turns… until you reach the General Sherman Tree, the world’s largest tree measured by volume (52,500 cubic feet); the tree is about 275 feet tall, and its trunk is more than 36 feet in diameter at the base. 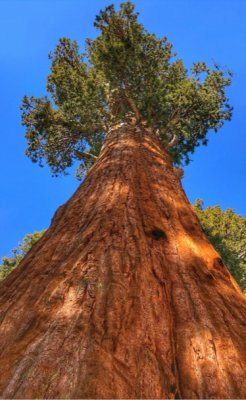 It is estimated to only be about 2,000 years old (middle age, as some sequoias are estimated to be older than 3,200 years old). The other hike to see these wonderful giant trees is Crescent Meadow and the Big Trees Trail (about a 1-mile loop). This location is a perfect growing zone for sequoias because of the elevation, sun, and water; sequoias need a lot of water and have a very shallow (but wide) root system. 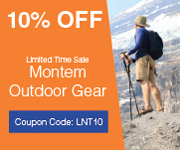 All your senses will be alive on these hikes. Your eyes on the trees, your ears to the gentle quiet, and your nose to the aroma from the phytoncides released by the trees. (Other trees found in the park include Ponderosa, Jeffrey, Sugar, and Lodgepole pine trees, as well as abundant White and Red fir trees.) The scent is truly intoxicating! We had hoped to hike up to Moro Rock, but the road is closed in winter, and the hike up there a bit too long after all our other ventures, but there is an amazing overlook just across from the Giant Forest Museum… from which Jenny took the featured photo of Ran at the top of this post. We are tree people, no question. And the sequoias are amazing and beautiful trees, but even the most cynical city person will be blown away while visiting. 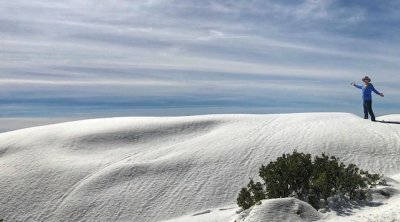 Put these parks on your list! 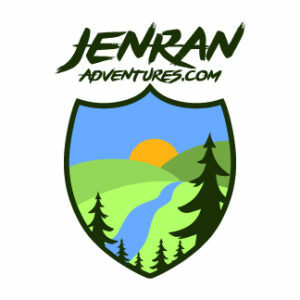 We stayed at a wonderful little RV park in the trees, Sequoia RV Ranch, in Three Rivers, just a few miles outside of the national park… but there are plenty of options for camping and lodging in the area.